If you've ever used the Internet, it's a good bet that you've used the Domain Name System, or DNS, even without realizing it. DNS is a protocol within the set of standards for how computers exchange data on the Internet and on many private networks, known as the TCP/IP protocol suite. Its basic job is to turn a user-friendly domain name like "howstuffworks.com" into an Internet Protocol (IP) address like 70.42.251.42 that computers use to identify each other on the network. It's like your computer's GPS for the Internet. Computers and other network devices on the Internet use an IP address to route your request to the site you're trying to reach. This is similar to dialing a phone number to connect to the person you're trying to call. Thanks to DNS, though, you don't have to keep your own address book of IP addresses. Instead, you just connect to a domain name server, also called a DNS server or name server, which manages a massive database that maps domain names to IP addresses. Whether you're accessing a Web site or sending e-mail, your computer uses a DNS server to look up the domain name you're trying to access. 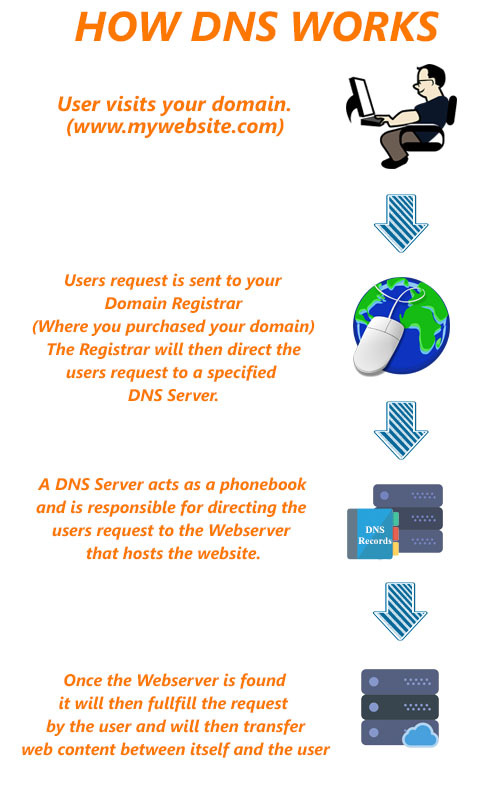 The proper term for this process is DNS name resolution, and you would say that the DNS server resolves the domain name to the IP address. For example, when you enter "http://www.howstuffworks.com" in your browser, part of the network connection includes resolving the domain name "howstuffworks.com" into an IP address, like 70.42.251.42, for HowStuffWorks' Web servers. You can always bypass a DNS lookup by entering 70.42.251.42 directly in your browser (give it a try). However, you're probably more likely to remember "howstuffworks.com" when you want to return later. In addition, a Web site's IP address can change over time, and some sites associate multiple IP addresses with a single domain name. Without DNS servers, the Internet would shut down very quickly. But how does your computer know what DNS server to use? Typically, when you connect to your home network, Internet service provider (ISP) or WiFi network, the modem or router that assigns your computer's network address also sends some important network configuration information to your computer or mobile device. That configuration includes one or more DNS servers that the device should use when translating DNS names to IP address.